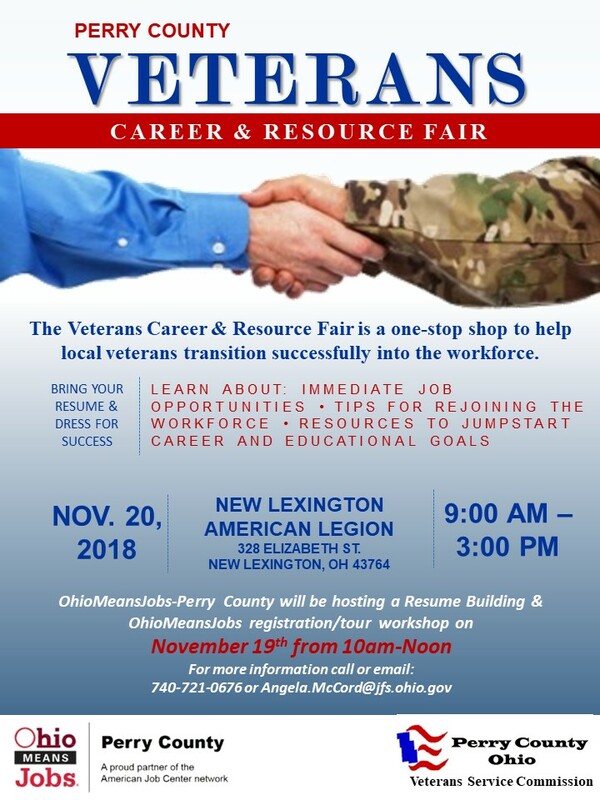 OhioMeansJobs - Perry County in conjunction with The Perry County Ohio Veterans Service Commission is hosting a Veterans Career and Resource Fair on Tuesday, November 20, 2018 from 9:00 a.m. to 3:00 p.m. at the New Lexington American Legion - New Lexington, Ohio. Bring your resume and dress for success! The day before the Career and Resource Fair, Monday, November 19, 2018, OhioMeansJobs will be hosting a Resume Building and OhioMeansJobs registration/tour workshop from 10:00 a.m. - 12:00 p.m.